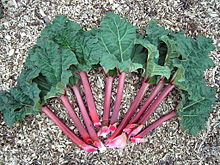 Rhubarub (Rheum rhabarbarum) is a species o plant in the faimily Polygonaceae. It is a yerbaceous perennial growin frae short, thick rhizomes. It produces lairge pushionous leaves that are somewhit triangular, wi lang fleshy edible stalks an smaw flouers grouped in lairge compoond leafy greenish-white tae rose-reid inflorescences.